TAKE A LOOK AT THIS FASCINATING HISTORICAL FILM OF ROOSEVELT ISLAND TAKEN IN 1903. This film was photographed from a boat heading south along the eastern shore of Blackwell's Island (known today as Roosevelt Island). The island lies in the East River, between Manhattan (which can be seen in the background) and Long Island City, Queens. It is approximately one and three-quarters of a mile long, extending from 51st Street to 88th, and at the time of the filming was the location for a number of New York City's charitable and penal institutions. The film opens showing the lighthouse at the north end of the island (Hallet's Cove) [Frame: 0186]. As the boat enters the east channel of the river, the stacks of a large brewery on Manhattan are visible in the distance . The camera pans along the island's granite seawall (built by inmates of the Penitentiary and Workhouse) and the following buildings, in order of appearance, are shown: the New York City Lunatic Asylum ; the Workhouse ; the Almshouse ; piers for the Queensborough (or 59th Street) Bridge, which upon completion in 1908 will span 135 feet above the island ; the Almshouse Keeper's House (originally the home of the Blackwell family, who had once owned the island) ; the Penitentiary ; Charity Hospital . The film ends before reaching the southern tip of the island. Copyright: Thomas A. Edison; 20May1903; H32034. Duration: 2:23 at 15 fps. Photographed May 9, 1903. Location: East River, New York. CITY DEMOLISHING GOLDWATER HOSPITAL FOR RESIDENTIAL? 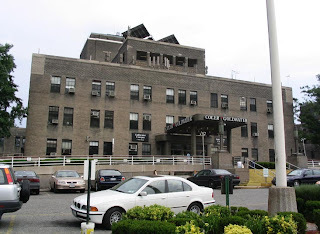 The New York Sun published a story today that the city is planning on consolidating Goldwater and Coler hospital thereby reclaiming the 10 acre Goldwater site just south of the Roosevelt Island Tramway station for residential development. Of course, the local Roosevelt Island newspaper, The Main Street Wire had this story last week. Kudos to the staff at the Wire for being first with this major real estate development story. According to residents. local politicians and RIOC officials, the inadequacy of Roosevelt Island's transportation infrastructure is a huge obstacle to residential development of this site. Congestion at the Roosevelt Island F train stop and the Tram during rush hours is terrible. Perhaps officials should revisit the idea of Roosevelt Island pedestrian access to the 59th street bridge via elevator, ramp and/or staircase as well as ferry service to Roosevelt Island. THE ROOSEVELT ISLAND AERIAL TRAMWAY IS TO ROOSEVELT ISLAND WHAT THE STATEN ISLAND FERRY IS TO STATEN ISLAND. IT IS A VITAL TRANSPORTATION LINK TO MANHATTAN FOR ISLAND RESIDENTS AS WELL AS A POPULAR ATTRACTION FOR TOURISTS. HERE IS A YOU TUBE VIDEO OF A TYPICAL TRIP ON THE TRAM FROM START TO FINISH. OUR FIRST POST IS TO WISH A VERY HAPPY BIRTHDAY TO THE UNITED STATES OF AMERICA. THE ABOVE PICTURE WAS TAKEN LAST YEAR FROM SOUTHPOINT PARK ON ROOSEVELT ISLAND. THERE IS A GREAT YOU TUBE VIDEO OF THE 2005 FIREWORKS DISPLAY FROM SOUTHPOINT PARK . THE ROOSEVELT ISLAND OPERATING CORPORATION (RIOC) CHARGES $18 TO ENTER SOUTHPOINT PARK IN ORDER TO VIEW THE FIREWORKS DESPITE THE FACT THAT IT IS A PUBLIC PARK FREE OF CHARGE AT ANY OTHER TIME. 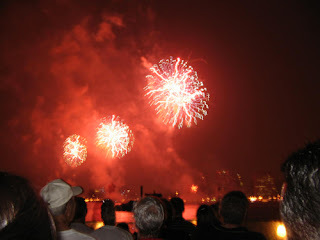 RIOC CLAIMS THAT, UNLIKE OTHER PUBLIC VIEWING AREAS FOR FIREWORKS SUCH AS THE FDR DRIVE OR BROOKLYN HEIGHTS PROMENADE WHICH ARE FREE, SOUTHPOINT PARK IS STATE LAND WHICH DOES NOT RECEIVE ANY MONEY FROM THE CITY TO PAY FOR THE EXTRA COSTS ASSOCIATED WITH KEEPING THE AREA OPEN FOR VIEWING THE FIREWORKS. IF THIS IS SO PERHAPS RIOC CAN EXPLAIN WHY THE RECENTLY OPENED EAST RIVER PARK, A NEW YORK STATE PARK ON THE WILLIAMSBURG WATERFRONT, WAS OPEN TO THE PUBLIC FOR VIEWING OF FIREWORKS?